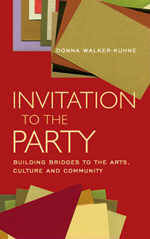 Acknowledged as the nation’s foremost expert on audience development involving America’s growing multicultural population by the Arts and Business Council, Donna Walker-Kuhne has now written the first book describing her strategies and methods to engage diverse communities as participants for arts and culture. By offering strategic collaborations and efforts to develop and sustain non-traditional audiences, this book will directly impact the stability and future of America’s cultural and artistic landscape. Ms. Walker-Kuhne has spent the last twenty years developing and refining these principles with such success as both the Broadway and national touring productions of Bring in ’Da Noise, Bring in ’Da Funk, as well as transforming the audiences at one of the U.S.’s most important and visible arts institutions, New York’s Public Theater. This book is a practical and inspirational guide on ways to invite, engage and partner with culturally diverse communities and enfranchising those communities into the fabric of arts and culture in the United States.